Three Bermudian track & field athletes — Tiara Derosa, Shaquille Dill and Dage Minors — have earned Region honours in the United States. Shaquille Dill, who competes for Saint Augustine’s University, earned U.S. Track and Field and Cross Country Coaches Association [USTFCCCA] NCAA Division II All-Atlantic Region Outdoor Track and Field honours in the 400m, 800m and 4×400 Relay. Dage Minors also earned All-Region honors in three events, Minors received NCAA Division II All-Eastern Region Outdoor Track and Field honor in the 800m, 1500. and 4×400 Relay. 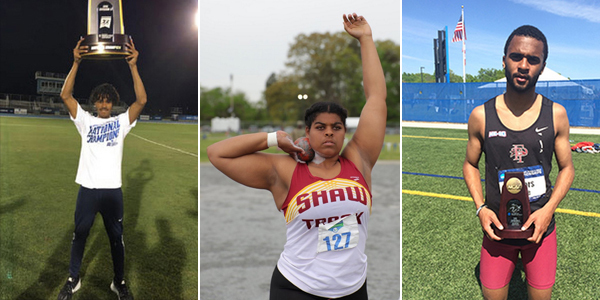 Bermudian Tiara Derosa, who competes for Shaw University, was also recognized by the United States Track and Field and Cross Country Coaches Associations [USTFCCCA] as an All-Atlantic Region Award winner in the discus.